Dragon King brings to you the splendour from China's Forbidden Palace where the ancient Emperor’s of China once resided during their glory days. Located just 3 minutes from Earls Court exhibition center and Earls Court (exit) underground station, this restaurant offers authentic Chinese cuisine serving large rice dishes and bowls of noodles for under £5. For quick eat, choose 13 dishes from the express takeaway buffet for only £4 a box. In China red is a colour of celebration and luck and happiness. 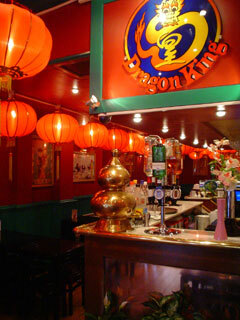 This is one of the many reasons why Dragon king has been attracting a host of loyal customers for years. Bright red walls complement handsome wooden tables and stools. The atmosphere is relaxed and informal, perfect to enjoy a hearty meal. Average price: £5 - £8 per head and House wine £9.90 per bottle. With its perfect location Dragon king specialises in business functions & parties for all occasions and can accommodate up to 80 guests. Service is warm and friendly. The Chinese regard eating as an art combining sight, smell, touch and taste. Chinese cuisine is a bright branch in the treasure-house of Chinese culture and the extensive menu is a reflection of this. Dragon king fuses nutrition and color, shape, appearance and taste perfectly.